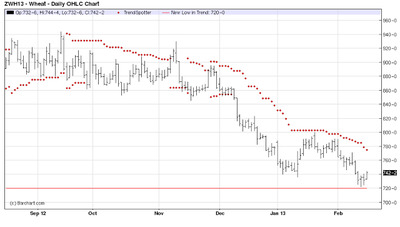 Down trending MarketThe Wheat market is definitely in a downtrend right now, and if we look at the 6 month chart we stand at $7.42 a bushel as of the close of last week. 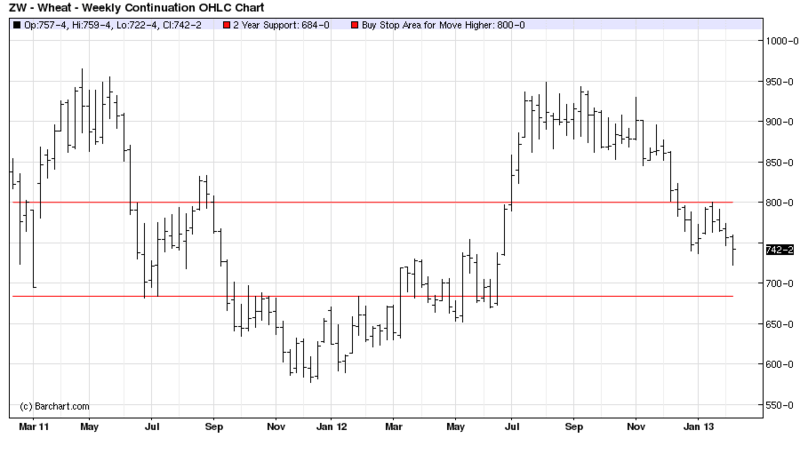 If we break $7.20 a bushel, then there are going to be a lot of sell stops positioned to sell Wheat lower to the next level of support at $6.84 a bushel. 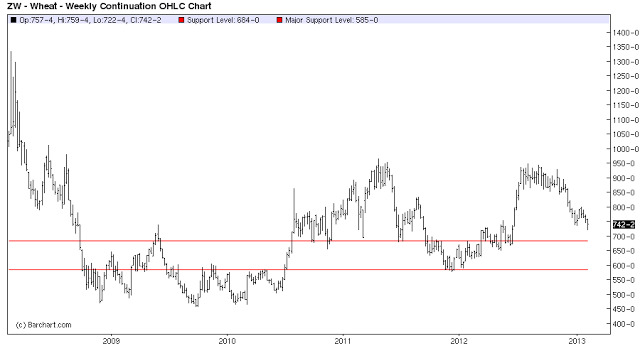 If this level fails to hold look out below as $5.85 is the next major level of support on the five-year weekly continuation chart and should hold. 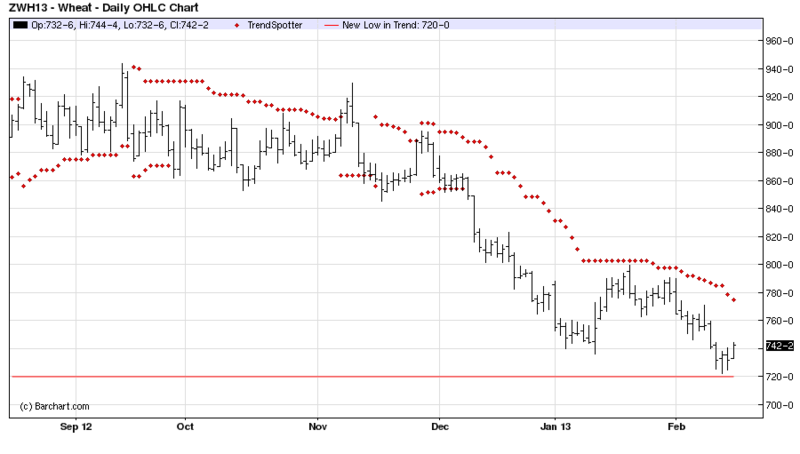 Now Wheat should bounce around the $7.00 a bushel area, probably first busting through it, and then spiking above it as price tries to find its equilibrium after establishing a new low. 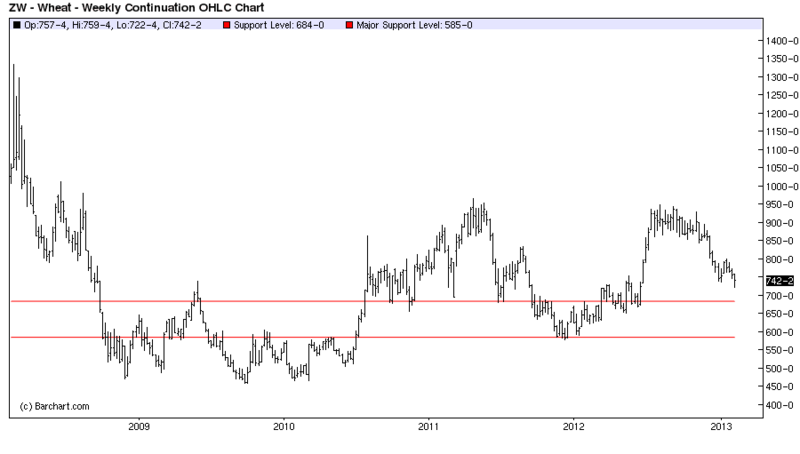 And obviously $6.00 a bushel provides a level of support being both a round number, which is heavily guarded, and near the two year low in the contract. 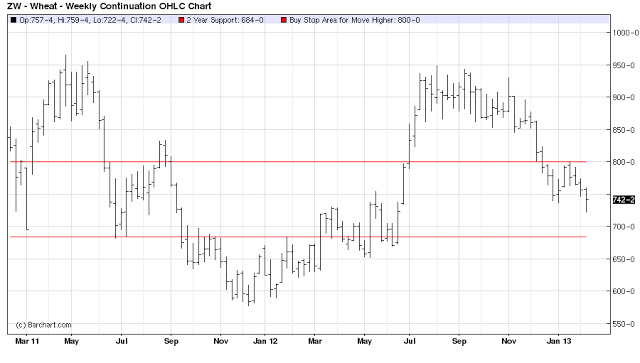 This is another area where I would expect Wheat to first push below $6.00 a bushel, then spike above it several times before making a strong run at the $5.85 level. 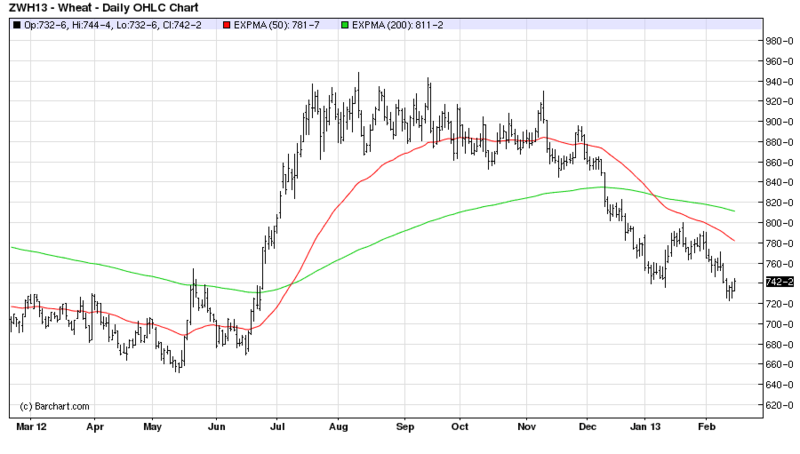 Interestingly we had the proverbial “Death Cross” in early January where the 50-day moving average crossed below the 200-day moving average which actually signaled a buy to many traders initially as price spiked to retest the $8.00 a bushel level, but soon faded and has been putting in lower highs and lower lows ever since. I often see that where a bearish technical signal is faded by buyers thinking selling and bearish sentiment is overdone. This is why I am often cautious when the media starts discussing Death Crosses, this often offers up contra-trend trading opportunities in the market. However, ultimately the Death Cross in Wheat proved to be prophetic as Wheat has confirmed that it is still in a bearish downtrend as each price spike is met with many sellers waiting patiently to enter in the direction of the trend, and eventually pushing the contract lower with each bearish thrust of price momentum. Now I will talk a little about the psychology and underlying trading philosophy that plays out in the price discovery process. Wheat is a commodity, and commodities trend, and there are two main types of traders in these markets. 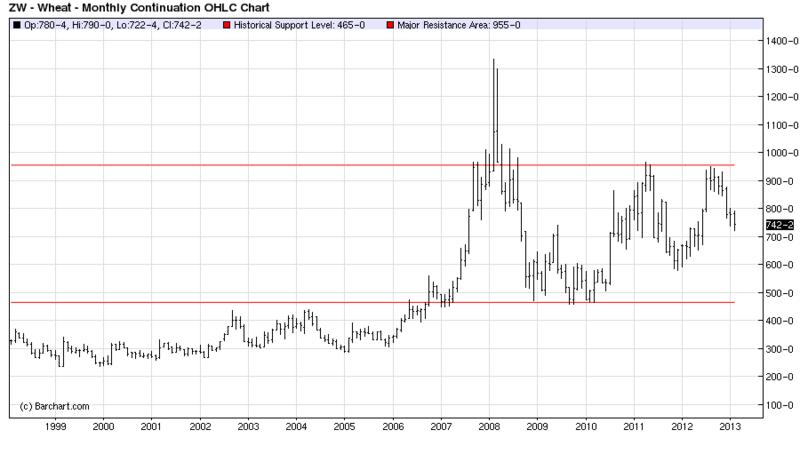 1) The traders who are looking at value in relation to historical Wheat prices the last two years, and they are looking for areas to buy and go long. 2) Then there are the traders who look at the market in the exact opposite manner. 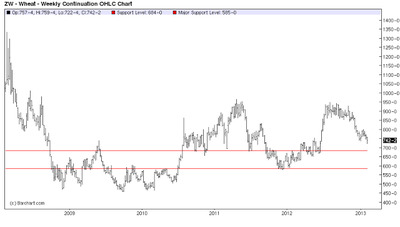 They see Wheat at these lower levels as a sign of weakness, and they are looking to sell new lows. It is a battle that plays out in price in many instruments, and one side eventually wins, forcing the other side to cover their position. There isn’t a rigid definition on why one side will always win because at some point it is definitely wrong to sell a bottom and buy a top, just look at the historical tops and bottoms on the charts provided to ascertain that conclusion. 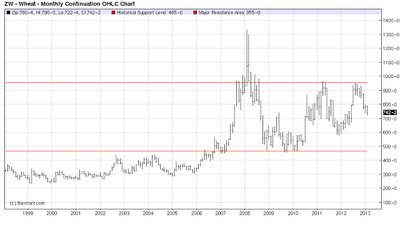 Some buyers and sellers bought the very top and sold the very bottom of the Wheat market the last five years. This is where proper money management techniques with strategically placed stops come into play. The ability to understand that momentum has shifted, the trade is invalidated, and price is going the other direction. Furthermore, it is underestimated the importance of being able to be flexible to get on the train going in the opposite direction of the original price assumption. Price tells them where the trade is invalidated; it literally forces the other side to cover at key technical reversals, which is your sign to be out of a trade if large numbers of positions are going to be forced out automatically via stops at key technical invalidation levels. Always look for technical areas where other traders would think the trade is invalidated, and place their stops. Sure there are stop runs and trading noise; and this is where feel comes into trading and strategically placing stops to avoid the creative stop runs and noise, and be on the right side of the price action to come in the direction of the trend. So there will be a lot of battles to come in the Wheat market between these two trading camps the value buyers and the trend sellers, and it is your job to determine who is going to ultimately win out, and the charts and technical analysis is your tool to help you in this quest. Sure the fundamentals are underlying these moves, and with high prices over most of the last 4 years, soaring farm land prices, and wealthy and fat farmers, things have been good in the agriculture space, and this probably plays out in some bumper crops if the weather cooperates. This is economic theory playing out putting downward pressure on Wheat prices. Be careful of “Value Traps”! 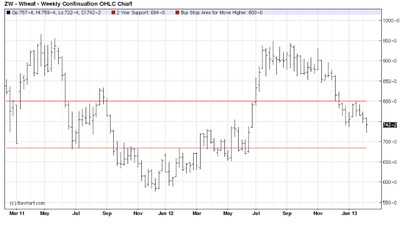 So at what price does the market determine that Wheat prices are a value? This should be taken into an analysis along with the fact that commodities trend, and they gain momentum runs, and areas where buyers and sellers have thought represented real value, failed to offer that for these investors, and their having to cover their ‘value investments’ provided additional fuel in the direction of the trend, i.e., prices can go in a trending direction far more than any investor rationally thinks is possible. Just look at the chart and that $13.00 a bushel Wheat price was a pain induced short covering rally that investors who came in ‘value shorting’ at $10.00, $11.00 and $12.00 a bushel thought was unreachable, i.e., or they would have waited until $13.00 to come in and short. So price can always go far lower or higher than one would think ahead of time in any market, but in commodities especially be careful not to make price assumptions. 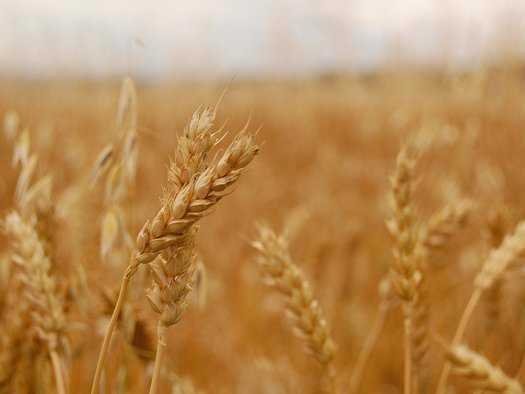 In summary, if Wheat gains momentum to the downside due to larger than expected bumper Wheat crops, and some key technical levels are broken, the trend traders will be piling on, and the value investors will be testing their pain threshold. Additional sharks will appear as the blood in the water of lower prices in a down trending market brings even more attention to the Wheat market, and before you know it outsiders who never thought of trading Wheat are pushing the contract lower causing more pain; that is how extreme levels in price get established in a forced liquidation process. If the Wheat market gains some more downward momentum, traders will see just how far they can push it lower. One has to be careful in picking bottoms because of this very fact, price invariably goes so much lower than you think is rationally possible. But as always the flip side is that if you pick the near term bottom, then you can get some exceptionally profitable bargains because price was pushed way to low or way to high. It helps if a big buyer or seller steps in right after the levels that you decide to enter the trade, as then you can comfortably move your stop up to guarantee a riskless free-roll on a trade. These are the holy grail moments in trading: you pick a top or bottom and a big player agrees with your market assumption; your trade is instantly profitable, highly protected, you experience no heat, and your only concern is where to place the stop to protect your profit but remain in the trade for the potential of a sustained trend in the new direction of the market.